Four Februarys ago, I attended two funerals in the same week. It was the first time that had happened. A month later I was in New York hanging out with my niece and nephew. My sister had decided to fly down from Edmonton during their spring break, and New York is always a great place for a family rendezvous. Funerals must have been large on my mind, especially as our cousin Debbie (z”l) had died that January. We were (and still are) still more or less reeling from that one as a family. Anyway, I was telling Elizabeth about the two-funeral week when this slid out of my mouth. Elizabeth burst out laughing and couldn’t stop. I accepted the invitation and joined her. Sure enough, it’s four years down the road and my dead people list keeps getting longer. 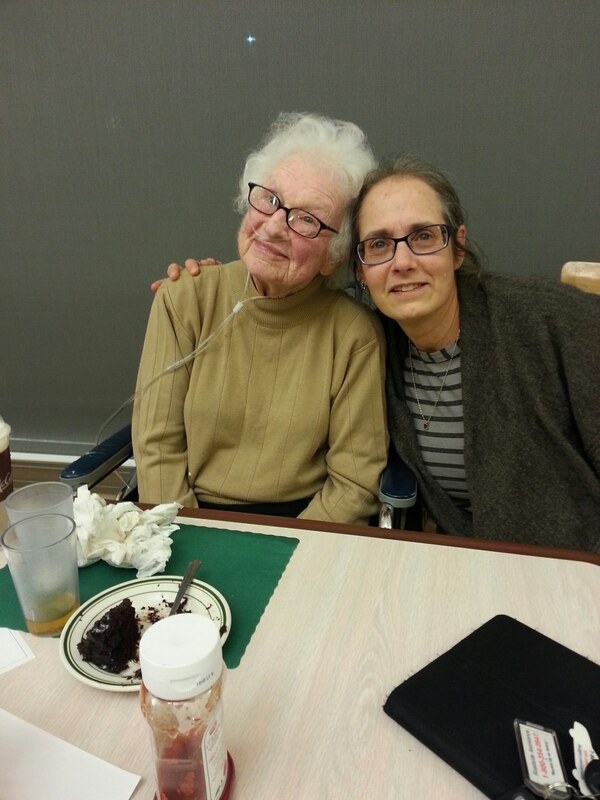 This past Thursday, our family friend Ruth Goldbas died. She and her late husband Moses loved my parents, and Ruth played a large and quiet role in helping to salvage what was left of my family the year after my father died. Once a week for that entire year, my sister and I would go to her house after school. Mom would meet us there when she got off work from her teaching job. They had seven children, which I thought was the neatest thing ever. Two were around our age, but way too smart and cool to pay attention to a couple of fatherless social misfits. To be honest, Debby and I probably weren’t great company at that point in our lives. That mattered not one iota to Ruth. She always treated us as if we were the most interesting people in the room, and always had a dinner prep job for us to do that made us feel welcome and useful. When I went to represent the family at Aunt Bessie’s funeral this past September, I used some of my 36 hours in town to find out where Ruth was living and go see her. It was clear that she was not going to be around for a whole lot longer, but getting to experience her radiant smile again was a huge gift. We just sat there, happy as a pair of pigs in you-know-what and then dialed up Mom, so she and Ruth could have a chat. When her son David showed up, he snapped a picture of us. Me and Ruth in September. Her son David took the photo, and her daughter Esther, who’d been up to visit the day before I showed up, had brought her the chocolate cake. Like his son David, Mosie was an attorney. He even merited a mention in Roger Kahn’s book “Good Enough to Dream,” about a season Kahn spent with the Utica Blue Sox. I mention this because on Friday, baseball great Ernie Banks (aka “Mr. Cub”) died. He never played for the Blue Sox, but he did spend a night at the Treadway Inn. I know this because our dad took me and my sister there the morning Ernie and his fellow Cubbies were to play an exhibition game in Cooperstown at the Hall of Fame. We brought our autograph books and cameras. The autographs are long gone, but I have my memories of Ernie Banks, and of his teammate Ron Santo. 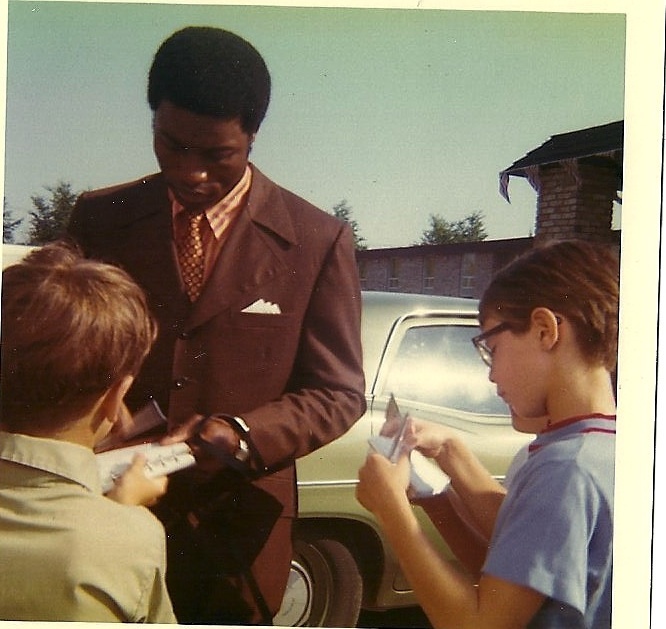 I took this picture of Ernie Banks in 1971, the year my father took us to get autographs from the Chicago Cubs. We weren’t the only kids there, as you can tell from this picture. Ernie Banks isn’t the only athlete I spent this weekend remembering. Baki may have made it into the Baseball Hall of Fame too, if he’d gotten a chance to grow up. I was at work the Monday morning he died. It was 2005, and Baki was 12. His parents Marge & Andy are two of my dearest friends. He wasn’t sick. He’d spent Sunday afternoon and early evening snow tubing with a group from synagogue. He went to bed happy, sharing a bed his nine-year-old brother, the way they always did. Their 16-year-old brothers shared another room, with separate bunk beds. M&A tucked four kids into bed that night. The moment before Marge went to wake them up for school was the last before her family’s life took a turn into a place no parent ever wants to go. More than 1,000 people showed up for his funeral. On Saturday, about 50 of us gathered at the same synagogue for a Baki-centered memorial. There was some singing, some study of texts from Pirke Avot, and a lot of great storytelling. We shared our memories of Baki and what of him we have carried forward with us these past 10 years. Baki was an astonishingly graceful and talented athlete. He was a middle child who navigated the shark-infested waters of sibling competition with the same elegance he brought to his soccer and softball games; he had a quiet sense of mischief he deployed skillfully and well. There was more than one comparison to Buddha, and those making it were people who had known Baki, but not one another. Everyone who spoke had beautiful things to say. His grandmothers read of adventures they’d had with Baki dating from shortly after he was born through to his last birthday, a month before he died. The most powerful moments of the afternoon, for me, centered around Baki’s classmates, teammates, brothers and the family friends who had been peers. Now young adults, they had experienced his death and mourned his passing as children. Seeing them express, as adults, with adults, the grief they felt as children in a setting where their friend’s memory was the focus, was profound. It was important for them in a way that was different for the rest of us, possibly because when you’re a child, adults are in charge. They may not be able to control death, but they control a lot of other things. So a kid experiencing a friend’s death may not really understand that the adults are as absolutely lost as they are in this particular situation. What I saw happen in those young adults, all with the same particular searing hole in their psyches, is as close as I’ve ever been to a healing event in a spiritual setting. For them, being able to pull those feelings out and air them in a setting where they were not only safe, but welcomed and encouraged, was transformational in a very different way than it was for us adult mourners. I know a lot of people, alive and dead. Yesterday’s event gave some things to chew on in terms of how it is and what it means to carry forward the memories of those we loved, liked and cared for. Today, it also makes me realize that down the line, if I’m lucky, someone will be doing that for me.